You may have hundrends of apps installed in iOS devices but not all of them are fully utilized and some may just stay there occupying your Springboard space. If you wonder which of them are most frequently used and how long they have been used, here is a simple app from Cydia that you can try. 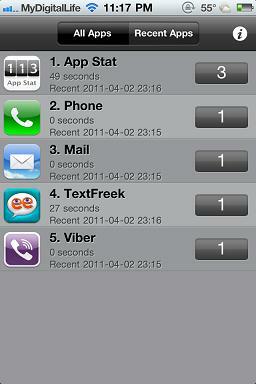 Named as App Stat, it displays the frequency of a particular apps being used recently, as well as the time use sorted in proper order. As usual, since this is from Cydia, users will need to jailbreak their iOS devices before can utilize the app. Assuming that you have done so, just head over to Cydia and do a search for App Stat (under Search section) will list down the respective apps ready for download. Tap on it to start download, install, follow by Springboard restart and you are done. By now, you should be able to find a new icon with the name of App Stat. Take note that there is no configuration required and tapping on it will launch the app which will display the statistic directly. By frequency of use, App Stat will display all your apps (either recently or all) used, with the duration and exact time on how you spent on them. Hopefully this simple app will give you an insight on how you use your iOS device. Required iOS 3.2 and above, App Stat is compatible with iPhone, iPod touch and iPad and is free download under Bigboss repository from Cydia.